The Rock Garden is also known as the Barbotey Rock Garden which is located some 10kms (or 6.2 miles) away from Darjeeling town in a valley down below. Ganga Maya is another park area located further down. As you take the right turn from the main Hill Cart Road of Darjeeling towards the Rock Garden, you know that you are in for a nature's treat. In about 25 minutes, this narrow winding downhill road descends by several thousand feet to a valley where the rock garden is located. There are sharp hairpin bends on the way and the gradient of the road is very steep. However the view of Darjeeling's landscape and the mountain range from the road is unparalleled. If you love scenic views, I am sure you will ask the cab driver to stop on the way several times for photo shoots. One of the great scenes you will notice on the way is the position of the clouds. You will see them somewhere down in the deep gorge, and as you descend quickly you will see them rising above you. It's just simply spectacular. Your first stop is the Rock Garden. As you get off the car, you will see many stalls being set up by the locals selling street snack and small souvenir items for the tourists. As you walk towards the garden, you will know why this is called Rock Garden. Because the entire garden area has been created by cutting rocks at different levels and making terraced seating arrangements at various levels. There is a wonderful waterfall that comes all the way from the top and over the rocks to down below. You will need to keep climbing stairs, go up the ramp and cross small bridges across the rocks to reach up to the top. From the bottom, it's not possible to see the point where this water flow is entering the garden. The climb all the way up may be tiring for some. However, there are beautiful flower gardens, trees and shrubbery at all levels along with nice seating arrangements. So you can rest and relax, enjoy the views around as you go up. 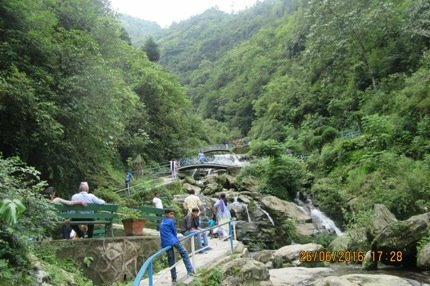 Barbotey Rock Garden was created by the Darjeeling Gorkha Hill Council (DGHC, now known as GTA) and inaugurated by then chairman of the council Mr. Subash Ghising. It was created to introduce a special attraction for tourists a little outside the town area so that the visitors have an added incentive to come to the hill town. After all tourism has been one of the main source of earnings for Darjeeling. About 3kms (i.e. 1.8 miles) further down is the Ganga Maya Park, which is another relatively new addition to the special attractions. Once you enter the premises of the park, you can find yourself at the foothill of mountains that come from all sides. Yes, this is a valley surrounded by hills and having a natural water stream flowing through it. There are beautiful small bridges built over the stream from where you can look at the crystal clear water flowing over the rocky bed. There is a small lake where one can also enjoy boating on paddle boats. At the end of the park, there is also a lovely fountain. If you walk around the park, there are wonderful flower gardens, trees and shrubs all across. It's easy to get to one of the many large rocks that are sitting right on the stream. 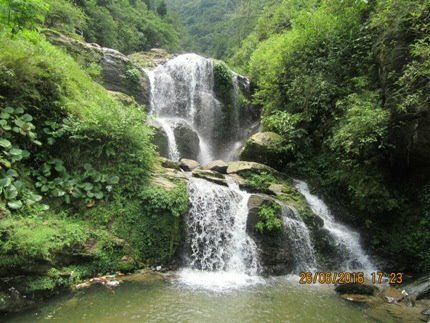 Sit on top of one of those, deep your feet into the water, enjoy the sound of the flowing water and the scenery around. We just love it. There is a large circular platform in Ganga Maya Park where local cultural programs like folk dances are performed during the high tourist season (Summer and Autumn). 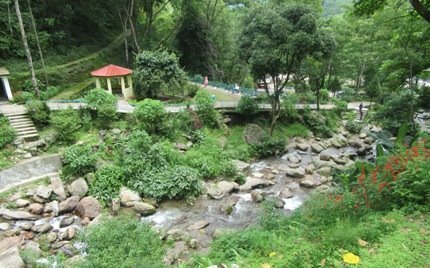 Barbotey Rock Garden is located some 10kms (6.2 miles) from Darjeeling town center. From the Hill Cart Road that leads towards Ghum, you will need to take right turn near Dali Monastery into a narrow road. It takes about 30-40 minutes to reach Rock Garden. Ganga Maya Park is further 3kms (1.8 miles) from here. Both parks have entrance fees. The gardens/parks are usually open from 10am to 4pm daily. There are entry tickets. You will need to book a taxi or a jeep to access the parks. It's difficult to get a return transport from Rock Garden or Ganga Maya Park. So it's always wise to book your car for the return journey. Rock Garden by self driven car - It is advisable to get a local hired bolero/sumo for visit to Rock Garden and Ganga Maya Park at Darjeeling. The vehicle has to get down at the bottom of the mountains through a very zig zag narrow road. You will be in trouble particularly when another vehicle comes from the opposite side. Also climbing back while return is a very tough job for the drivers of plain area. Best of Luck. Is it possible to visit Rock garden with our own vehicle(i-20). Is there any place in Darjeeling which cannot be visited with private vehicle? Yes you can but be careful (extremely narrow and steep road). You can take your private car to all tourist places in Darjeeling that are accessible by road.